We come finally to the last substantive chapter in Borgmann’s essay on technology. It also happens to be the longest, so buckle up! The question is: can the reform of technology, so vividly imagined as “wealth” defined by focal concerns in the previous chapter, be taken out of private life into the public sphere, ultimately changing the very heart of the systems that we have so little power over as individual citizens? One option would be to press for legislating morality, arguing that technological reform is really moral reform that should be encoded in the legality or illegality of individual behaviors. This is what conservatives generally try to do in other spheres. But Borgmann points out, echoing his thoughts in Chapter 14, that “morality”, especially traditional morality, is a less commanding force in the lives of most citizens than conservatives usually estimate, even as a concept. (And of course it doesn’t help conservatives that they often undercut their moral argument by trying to outlaw certain types of supposedly immoral individual behavior while simultaneously promoting clearly unjust and immoral economic policies that have wide-ranging negative impact). In other words, this strategy would be paternalistic, harmful, and ultimately self-refuting (according to the norms of deictic discourse). And it is in fact in the laws of the economy that Borgmann thinks we have the greatest opportunity to effect real change. What does economic reform that leads to technological reform look like? It begins with convincing the public that the “quality of life” and the “standard of living” are not one and the same. As a society our economic policies have been focused on the standard of living (as measured by the production and possession of commodities) as a proxy for quality of life, but in fact this is a bad proxy, as the previous chapter showed. We thought that “affluence” was what technology promised us, but it turned out to be hollow, a never-ending escalator of commodity consumption. Instead, Borgmann’s concept of (non-material) “wealth” is what truly leads to higher quality of life. Thus we need to convince the public to focus on quality of life at the expense of the standard of living, to argue that economic policies which promote such a view are a good trade. How is such convincing even thinkable? How do we take the world of focal concerns (private, deictic discourse) into the world of labor and politics (public, political discourse)? We can’t impose some “national focal concern”. We can’t remake society on the model of pre-technological production; at this point there’s no getting rid of technology, in the background of production at least. Individual focal concerns could bubble up naturally through the disparate care and passion of individual citizens, but what about an actual public discourse? What will help is to bring to light the pattern of technology (what this book has been about) and talk about it. But in terms of actual change, again only deictic discourse will sway the public’s heart. And so far we’ve only seen deictic discourse effective in more private arenas, about the majesty of private pursuits like running and so on. Part of the problem again lies in how the pattern of liberal democracy is set up. Public deictic discourse would expose the world to some kind of moral critique or evaluation, and liberal democracy is organized so that such critique is kept out of the public sphere. The legal system is idealized as amoral, like a technological device, at least in terms of how it understands itself (of course, it smuggles moral considerations in through the back door by tacitly specifying a concrete vision of the good life, as Borgmann discussed in earlier chapters). So we come back to the earlier question: how could economic reform be possible, given the challenges inherent in public deictic discourse? Without getting into the professional economic implementation details, we can say that it begins with the philosophy of economics, which is currently complicit with the technological paradigm in its singular focus on the “standard of living” or affluence (paralleling the Device Paradigm’s focus on “availability”), falsely narrowing the scope of the good life. Lester Thurow has said, “Man is an acquisitive animal whose wants cannot be satiated. This is not a matter of advertising and conditioning but a basic fact of existence” (231). Thus the justification of acquisitiveness as the fulcrum of economic philosophy. But Borgmann points out that this doesn’t accord with what we actually know of the greater part of human history, where, once basic needs were satisfied, time was spent in non-acquisitive activities like play or celebration. So it seems possible to engage the public in this way. But do people actually want reduced affluence to attain “wealth” in Borgmann’s sense? Studies do suggest a general willingness to cultivate a “simpler” lifestyle, but maybe this is purely aspirational. What we need is a “collective affirmation” on a societal level, like we have in cultural norms of politeness (on the invisible end of the spectrum) or in the Constitution (on the formal end of the spectrum). Borgmann thinks we already have a sense of the tension between “quality of life” and “standard of living” in the form of the tension between considering public goods to be indicative of economic success in our country versus a standard of measurement like the GNP. Here, “public goods” parallels “quality of life”, and “GNP” parallels “standard of living” (a much simpler financial measure, to be sure, than the value public goods like infrastructure, water, parks, public spaces, etc… provide). Transitioning to a model of economic success built on top of the quality of life would inevitably entail a certain shrinkage of the technological machinery at the heart of our industrialized society, but not by orders of magnitude. Many people would still work in the maintenance of said machinery, or would perhaps have no work at all. But what about work, which has been the cornerstone of meaningful engagement with the world up until the Industrial Revolution? We already see people who don’t strictly have to work returning to artisan-style pursuits—bakers, potters, metalworkers, etc… And Borgmann sees in this an opportunity for the institution of a two-sector economy. So we want to see a two-sector economy where the production of certain goods like food, furniture, clothing, health care, education, arts instruction, etc…, is entrusted to local, labor-intensive industries (where “engaging work” happens). The “planning system” or a centralized industrial economy would then take care of infrastructural goods like transportation, utilities, communication, as well as the tools and materials required by the other sector, insurance, finance, and R&D. Technology would live on here as the context for the former sector, not the center of our lives. We would encourage this economy not by imposing quotas or embargoes on the planning system, but rather by giving tax credits or breaks to the local, labor-intensive sector so that they become competitive in the market for their goods. Of course, there are lots of potential problems with this sketch, but the basic ingredients are there, as long as we are willing to accept a reduction of overall affluence to subsidize these quality-of-life improvements. Borgmann closes the chapter by exploring two concrete political issues as examples of how we could engage on a political level to help the cause of technological reform: the plight of large cities and social justice. 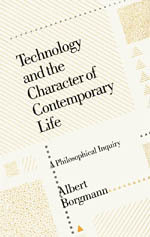 He shows how the technological pattern has been instantiated in these parts of life to detrimental effect (the urban/suburban distinction mirrors the labor/leisure distinction, for example), and how a public focus on quality of life rather than affluence would serve to forestall the disintegration of civic life and the reduction of social justice. He wants to see public structures “opened up”, i.e., made intelligible and inviting for us to engage with. The artifacts of our technological substructure like dams, power plants, office buildings, etc…, could be redesigned so that they are not opaque, intimidating, or lifeless, and instead invite curiosity and understanding. Likewise we need memorable places in the sense of places that allow engagement, not just passive enjoyment (cf. the fate of churches or cathedrals in so many European cities). We need, as he says, an “enactment of culture”—spaces designed for the focal concerns of sports, music, arts, worship, and work. Social injustice is a more visible problem. Borgmann laid out the problem in Chapters 13 – 16: liberal democracy has allowed the broad middle class to tacitly specify a definition of the good life that is actually complicity with technological consumption. Social injustice has become the hidden injustice that allows that consumption to continue. If the middle class were to care more about quality of life than the standard of living (affluence), and is able to seek after wealth of engagement via focal concerns, then that wealth is open to everyone in a way that affluence was not. There is no more need for the moving escalator that keeps classes forever divided. And of course letting go of affluence as the end goal means that there is more likelihood that money, the means by which the lower classes might achieve a basic quality of life, won’t just pool together, locked in the upper echelons. In sum, Borgmann thinks that the path to political affirmation of the reform of technology is this: deictic discourse leads to collective affirmation, which leads to a two-sector economy focused on quality of life and engaging work, which can lead to a reform of the cities and bring about greater economic justice. At that point we’ll have begun a true and lasting reform of technology—not eliminating it, but putting it in its place as the servant of the good life. It’s somewhat funny to me that as I read this chapter, I knew that Borgmann’s intention was to broaden the perspective of how this work can have an impact in the world. Yet, I found myself localizing the things that he discussed — perhaps this is his point. I couldn’t help but think about my own maintenance of the CHAOSS community. (1) Maintenance and improvement of communication, (2) production of certain goods and services, and (3) research and development. These stem from Borgmann’s more automated sector of the economy (ironically). I find these things to be very focal considerations when developing a community — something that I find to be a focal concern. Perhaps this is to my earlier point that I’m just not seeing the world the same way as Borgmann when it comes to the applied or predictive power of the DP. While I fully agree with everything up to these last two chapters, there were simply too many hypotheticals to gain much traction for me. There was an interesting analog that I found with the Roads and Bridges report that Borgmann would find an opening of the structures (roads and bridges). This gives them an intelligible design — inviting people to contemplate and appropriate the structures.